available in various designs, and that’s a baby swing. Most parents call them the “lifesavers” while others wonder how they ever survived without one. We have reviewed the top ten best baby swings to simplify your search. leave the baby unattended just because they are quite or playing with the various toys. Be around or check on them after every few minutes. Is a baby swing a-must-have baby product? There are many baby swings on the market, all aimed at soothing and entertaining your baby. However, there are certain features that set each apart. These are the features that determine whether you’ll walk away with a personalized baby swing or you’ll be forced to return it. The best baby swing should have the most comfortable seat because the baby will be in it most of the time. It should be well-padded, have a soft and warm cover, and it should be easy to clean. The other thing is the seat belt. Baby swing seats have 3-point or 5-point harnesses. These help the baby to stay put, safe and secure. For a baby, no matter how young or old, head and neck support is very important. Mostly because they might not tell when it’s not comfortable and you might think that they are just fussy and try to return them in the same uncomfortable position. According to this study, poor head and neck support is the cause of most emergency room visits. Also, see what Consumer Reports say about baby-swing safety. Some swings are high while others are very low. If for some reason you can’t bend too low, choose a high swing. However, if you are always cautious about the risk of falling, go for a lower baby swing. Some babies love slow motions while others enjoy faster ones. And, your baby might change their swing motion preference as they grow, so going for a baby swing with multiple swing speeds will be ideal. Some baby swings are portable while others are not. A portable swing will be light, compact in size, foldable, and easy to take apart and put together again. If you will be traveling with your baby, go for a portable baby swing to enable them enjoy their swing even when far from home. This is a huge deal when it comes to baby swings. Some are electricity and battery powered while others use either. The problem with battery powered swings is that you will keep buying and changing batteries, and this might be costly, but it’s a good option for a portable swing. On the other hand, you have to be careful with electricity powered swing because you must know what voltage to get based on where you live. The easier it is, the better for everyone! Why we like it: The feature list is incomparable and it’s very reliable. The Snugabear is just one of the great themes that Fisher-Prince’s Cradle ‘N Swing has and it’s awesome. The frame is sturdy and the seat is very comfy. 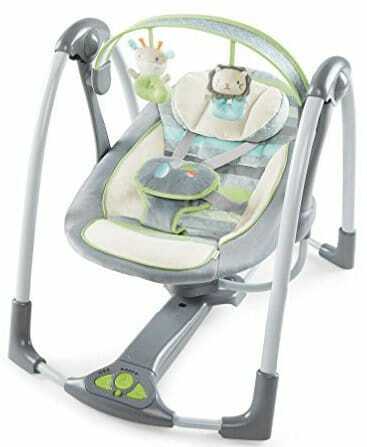 Fisher-Price is known for manufacturing reliable baby products and My Little Snugabear Cradle ‘N Swing tops the list. The swing is built to keep the baby comfortable as it has a deep, well-padded and soft seat. The seat also has three adjustable positions and two-position recline. It is also designed to rotate to either face right, left or remain at the center. This means you won’t have to turn the whole swing in case the baby needs to face a certain side. The head support is great too. When it comes to soothing the baby, the Snugabear Creadle ‘n Swing has two swing motions. It can rock side-to-side to soothe the baby or swing head-to-toe. This is why it’s referred to as a cradle and swing. And, it incorporates the Fisher-Prince SmartSwing Technology for that smooth swing in every speed setting. It has six swing speeds. Apart from swinging, your baby will have 16 songs and nature-inspired sounds to enjoy. The swing also has a motorized mobile that will keep your baby busy for some time before demanding for your attention. It has owl mobile toys and mirrored globe for the baby to stare at or try to reach thus improving their eye-hand coordination. The weight limit for this is 25 lbs., thus can be used by babies from birth until they start attempting to climb out of it. This baby swing is a little on the large side which is a great thing to have, but might be limiting for people with small spaces. The motor is loud, but not in an annoying way. This should be expected because this is a heavy-duty baby swing, but the good thing is that it’s not too loud to be annoying. Why we like it: Offers comforting back and forth movement for the baby. Has a reclining seat, various nature-inspired sounds to get the babies’ attention, vibration, music and toys. It’s also lightweight compared to other options, most compact and quiet. The Graco Glider LX Gliding Swing is not only quiet, but also small in size, thus ideal for small spaces. Setting this baby swing up is so straightforward and takes just a few minutes. It is also more convenient as it features a compact size, a strong frame, and looks great, thus giving you the best value for your money. Graco gliding swing swings smoothly and gently thus soothing the baby. It only swings forwards and backwards while gliding at 6 different speeds. It’s suitable for both newborns and big babies as it features two slower speeds designed for newborns and four faster speeds designed for big babies. You can use either batteries or plug in the wall. The baby’s comfort should come first, otherwise they will hate the swing and you won’t get value for your money. The Glider LX features a well-padded baby glider seat to keep your baby all comfortable. And, this seat also has a vibration function, though it only works with batteries, thus soothing the baby even more. Again, the seat can be reclined to two different angles thus more comfort. If you have a specific nursery theme for the baby, it would be awesome if the swing matches it. This Graco baby swing is available in six different styles to choose. The sound machine plays up to ten different classical musical melodies and five different nature-inspired sounds: bird sounds, waves, running water, heartbeat, and rain. And, you have the option to completely turn off the music. Why we like it: This is a feature packed baby swing. All the baby swings in the Fisher-Price collection have a lot of exceptional features, but the Sweet Snugapuppy leads the pack. While the Graco Glider LX only swings back and forth, the Fisher-Price Sweet Snugapuppy Dreams has a rotatable seat, thus allowing it to swing side-to-side and back and forth. It features a button that you press and twist to rotate it. And, in addition to the rotating feature is two reclining positions. It has six swinging speeds to soothe and keep your little one comfortable, and the swinging remains so smooth in whatever speed. It’s a very versatile baby swing. The seat is designed to look like a little puppy and it has a removable cover for easy cleaning. It’s machine washable. Baby swings are meant to either soothe your baby to sleep or keep them entertained if they are not ready to fall asleep. This baby swing has plenty of features to keep the little ones engaged. It has a mirrored globe plus mobile to catch their attention. It has a switch that you use to make the motorized mobile begin spinning together with the little playful circling puppies. They go around the baby and it’s so adorable. It also has a bunch of music and nature sounds to choose. 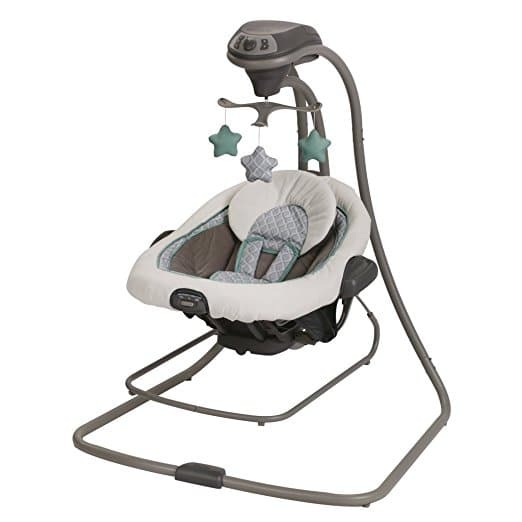 Baby safety comes first, and the Fisher-Price Sweet Snugapuppy Dreams Cradle ‘n Swing observes this by having a 5-point safety harness to keep the baby secure and safe as they swing or reach the toys. It’s also strong and all the materials used and included toys are safe for your baby. It’s not fully collapsible. The legs are partially collapsible, but the seat is made of hard plastic as opposed to all fabric options, thus more bulky. It’s more costly compared to Graco Glider LX and doesn’t have the vibration feature, but it has a mirror and the rotating mobile. Why we like it: Despite it costing more, 4moms mamaRoo 4 has the leanest design and offers a wide variety of motions. It’s also very easy to set up. At a glance, you might think that this baby swing is heavy, but it’s actually lighter and very compact compared to most other options. 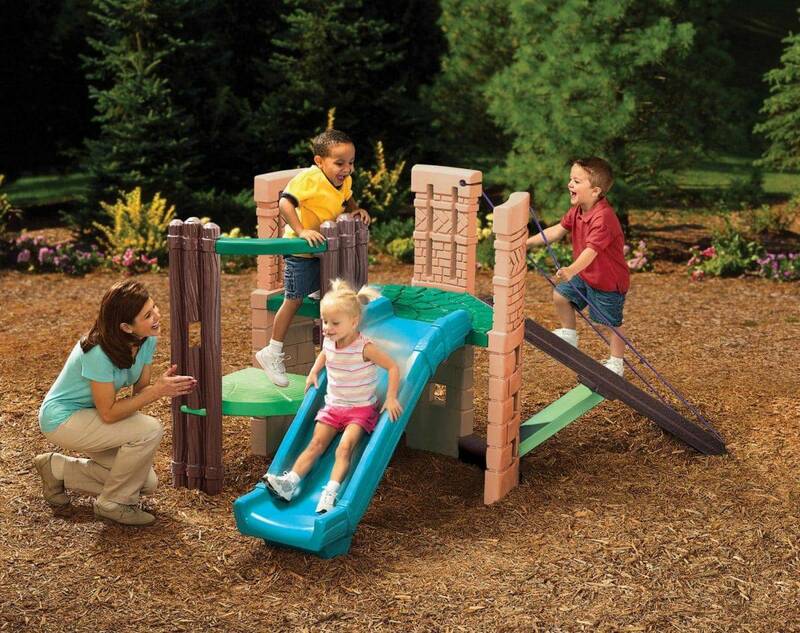 It offers various motions, five nonlinear movements (rock-a-bye, wave, kangaroo, tree swing, and car ride) and has five different speeds for each setting. It can play just any music that you prefer through the audio input. It also has various nature-inspired sounds, and if you don’t have preprogrammed music, it has an aux port where you can plug a device to play the music you want. Again, you can operate it remotely through a Bluetooth-enabled device. First off, setup is super-fast. The guide is clear, there are no many parts to put together and you won’t need any tools. The seat is removable and the process is easy. It zips directly to the swing’s frame. Again, controlling the sounds and the motion is even simpler with the 4moms app that enables you to change them via Bluetooth using your device. Just download the app. It’s a good alternative to the control pad, especially because it is located on the base, forcing you to bend way too much each time you need to change any of the settings. The removable seat is easy to remove and reattach. Most baby swings have 5-point harnesses, but the mamaRoo has 3-point safety harness. Why we like it: It’s a swing and a rocker. It’s easy to carry the rocker around as it has a clever handle and has a vibration feature to soothe the baby both in swing and rocker setting. The seat is rotatable and has two power supply options, AC and 5D batteries. The Graco Duetsoothe is a great option for people who are torn between getting a swing or a rocker. The seat can easily be removed then placed on the ground to function as a rocker. And, the vibration feature will work whether it’s being used as a rocker or a swing. Again, just like the Fisher-Price Sweet Snugapuppy baby swing, this too has a rotatable seat, thus allowing the baby to either swing back and forth or side to side. Apart from the features that are meant to soothe your baby, (swinging, rocking and vibration), the Graco Duetsoothe has some great entertainment features. It provides a variety of baby entertainment themed music and nature-inspired sounds. 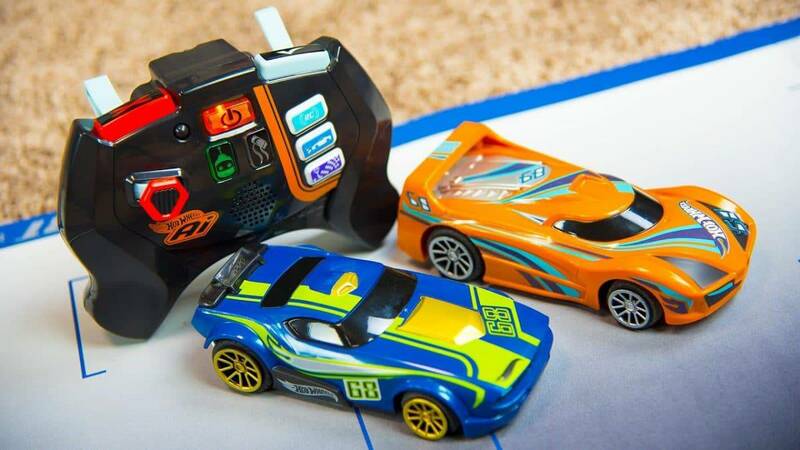 It also comes with several toys and controlling it is easy. About the safety, unlike the 4moms mamaRoo 4 that has just 3-point safety harness, this has a 5-point harness to keep your baby secure and safe. The weight limit, just like the Graco Glider LX is 30 pounds, meaning it’s ideal for both small and larger babies. It has a mobile, but it does not rotate. Switching any of the functions off, music, swing, and vibration, has to be done separately. No single button to switch everything off. Why we like it: It’s the best baby swing for small spaces. It features a simple design, but still very versatile. It also comes at a great price point. To start us off, the Graco Simple Sway Baby Swing is designed for people who are after just a simple baby swing, small enough to not take up too much space, yet versatile enough to meet their needs. It features a small frame design which makes it a perfect choice for smaller apartments or rooms. It also features a simple mobile and even though it doesn’t spin it’s very cute. But, do not mistake the simple design with weak design because this baby swing is very sturdy and made of durable materials. The two main purposes a baby swing is to soothe and entertain the baby. When it comes to the two, this baby swing doesn’t seem simple anymore as it has just as many such features as you would get in the larger swings. First, it has two vibration settings and six swing speed options. As such, it’s capable of soothing your baby to sleep just as any full swing would. It also swings side to side, thus it’s a simpler alternative to the Cradle ‘n Swing. About the entertainment, the Graco Simple Sway Baby Swing plays up to ten musical tunes and has five different nature-inspired sounds. The simple mobile will also keep the babies engaged as they stare or try to grab the toys, thus improving their eye and hand coordination. 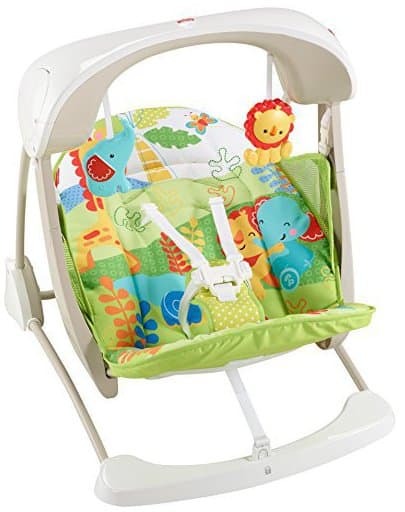 The baby swing has a 5-point harness to keep your baby safely secured and the weight limit is 30 pounds, thus it can be used for both small and big babies. It also has the option to either use batteries of plug into the wall and it comes with a power adapter. The seat is soft and comfortable. The seat cover is removable and machine washable. Being a simple baby swing, it lacks some great features that you will find in other swings. It lacks the reclining settings, doesn’t swing back and forth, and the legs don’t fold for easy storage. Again, at high settings, the motor can be a bit louder, but given the price, it’s worth investing it. Why we like it: It’s the best portable baby swing and stationary baby seat. It folds up compactly and easily to make it possible for you to travel with it. It also features a rainforest animal design giving it a great look. Again, the handle is strong and comfortable to enable you to carry it around. If you travel a lot, then you will want to get a portable baby swing to ensure that your baby will enjoy the same soothing and the entertainment they get at home. The Fisher-Price Take-Along Swing and Seat is the most portable baby swing, and every feature makes it ideal for travels. It’s lightweight and in a compact size such that it’s easy to carry around and doesn’t take up too much space. It also folds well and the handle is comfortable to enable you cart it around. First, being a seat and swing, this will appeal to most parents as well as babies. As a swing, it has six soothing speeds for your baby to enjoy. On the other hand, it easily converts to a seat and as a seat it provides vibrations. Thus, if your baby can sit down, then you can switch from one to the other. It also has ten songs and two nature-inspired sounds to entertain your baby. 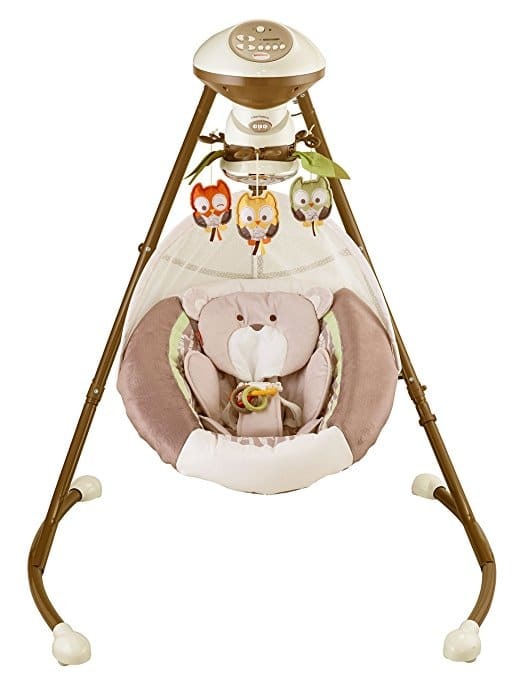 The take-along swing and seat also has two attached toys hanging down to keep your baby engaged as they stare or try to reach them. The seat features shoulder harnesses and it’s well-padded to keep your baby comfortable. The swing is reclined for more comfort. The weight limit is 25 lbs. Max weight is 25 lbs. so it might not be ideal for kids older than 6 months. Why we like it: This is the best affordable baby swing yet still offers just as much as you would expect from the expensive options. It provides multiple speeds and great music plus nature-inspired sounds. It also comes apart easily, thus very portable. With a gliding motion, the Graco Glinder Lite Baby Swing will not only soothe your baby when at home, but wherever you want as you can easily take it apart, lay it flat in a suitcase and travel with it. It is lightweight and putting it together again is easy. The seat is roomy and has a great head support, all covered with soft fabrics. The weight limit is 20 lbs. so it’s clear that it will only accommodate small babies and it has all the features to soothe and entertain them. It has six gliding speeds and they are all so smooth and also has five nature inspired sounds plus ten classical melodies. If you enjoy the outdoors, this is a must have item for your baby because of the portable frame and the comfortable seat. It also has a bar over the top with two dangling stars that can keep your baby engaged as they stare or try to grab them, while also helping with eye/hand coordination. The only downside here is that you have to take the bar off each time you need to get the baby in or out. However, you can opt to leave it off completely. Apart from the few hiccups, this is a really great baby swing, better than what you would expect given the price. If you are looking for a baby swing for colic, this will be of great help. It can only be used by small babies as the weight limit is 20 lbs. 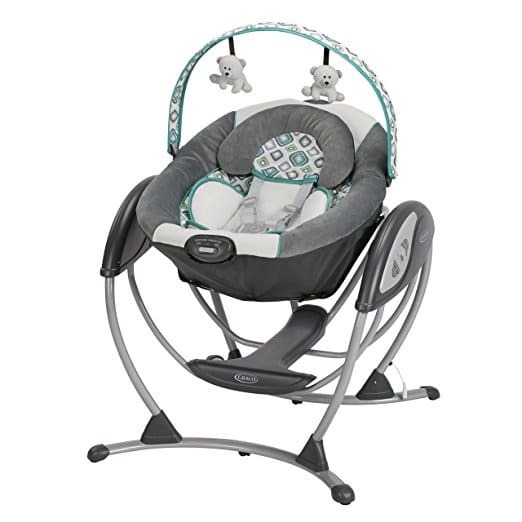 Why we like it: It doubles up as a swing and a bouncer, has a vibration function with two speed settings, the seat is roomy and it reclines to keep the baby comfortable. 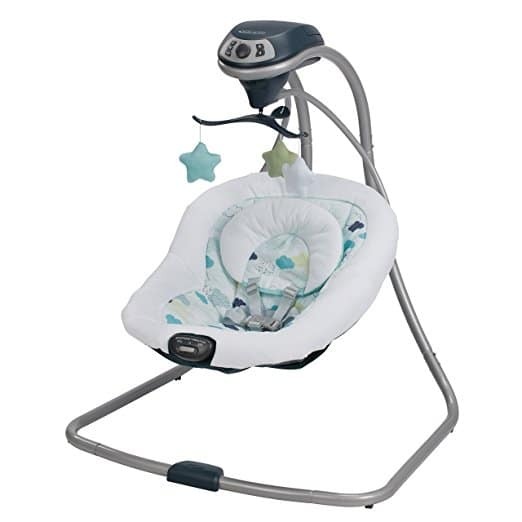 It’s ideal for both infants and big babies and has six swinging speeds. The Graco DuetConnect LX Swing and Bouncer is a good alternative to the Graco’s swing and rocker version. To convert it to a bouncer, all you do is remove the swing seat place it on the floor and voila! It offers six swinging speeds and they are all smooth, and two vibration settings. The vibration mode runs on battery only, so remember to purchase some along with the swing. It also has five nature-inspired melodies and ten tunes to help in soothing your baby to sleep. The seat is not only plush, but deep and has a 5-point harness to keep the baby safe and comfortable. 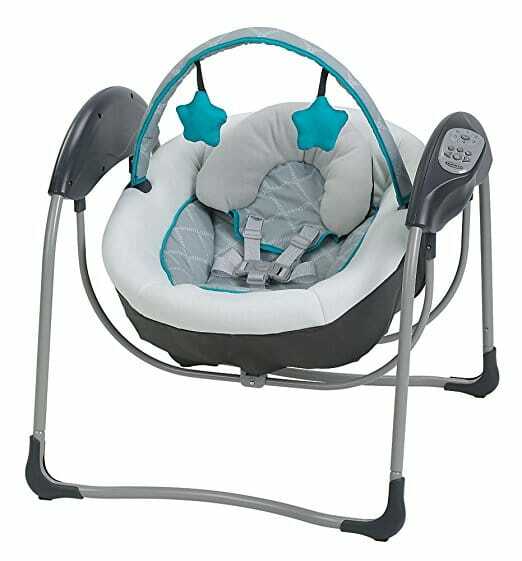 The frame is also very stable and this is a guarantee that your baby will be swinging in a safe swing and the reclining feature adds more comfort. The only downside is that swinging is limited to side-to-side. No back and forth swinging. It’s not the easiest baby swing to assemble. You will have to follow the instructions keenly to get it right and fast. 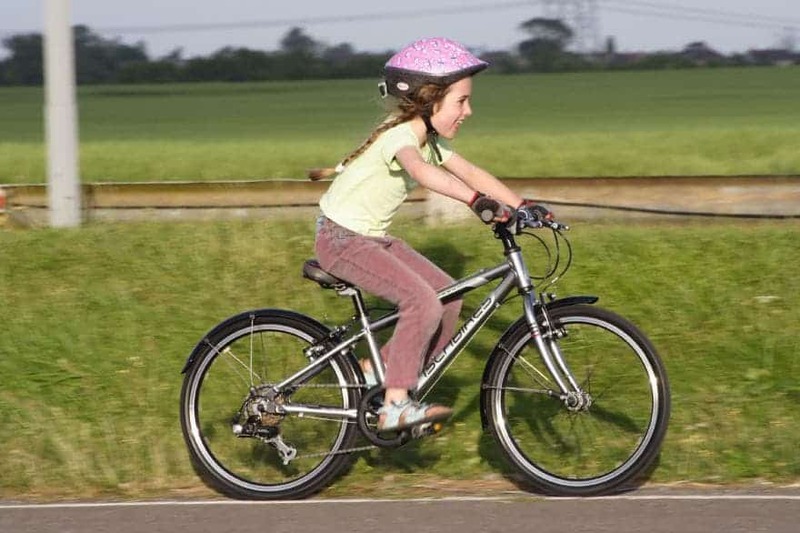 Why we like it: This is another take-along option as it folds flat to enable easy storage or transport. It’s sturdy and the seat is comfortable. It has a great head support and it uses electricity or batteries for convenience. If you don’t want a bulky, heavy, or a baby swing that will take up a large space then the Ingenuity Power Adapt Portable Swing might be a great choice. It is not only small, but strong and lightweight. It also folds up flat to enable you store it under furniture or in a suitcase when traveling. Taking it apart and getting it together takes just a few minutes. The colors are neutral and you can get a unisex theme if you will want to use it in the future. It offers five swing speeds, thus soothing even the fussiest kids. It also has eight classical melodies and three nature-inspired sounds to help the baby relax and fall asleep. The volume also has three adjustable timer settings, 30, 45, and 60 minutes. About the power, you have the option to plug in or use batteries. The swing features the hybridrive technology that makes the batteries run three times longer. The whole thing is super comfortable for the baby. The fabric is soft and warm and you can easily clean them. The swing comes with care instructions. It also has a removable toy bar with two dangling plush animals to help your little one with eye/hand coordination. The motor is generally quiet and you won’t even hear the swinging motion. It’s suitable for both newborns and big babies because it’s super comfortable and strong. The harness has a great fastening system that keeps the baby comfortable and secure. We have baby swings, rockers, bouncers, etc. and if you are not keen, you might buy one only to realize later that it’s not a swing. 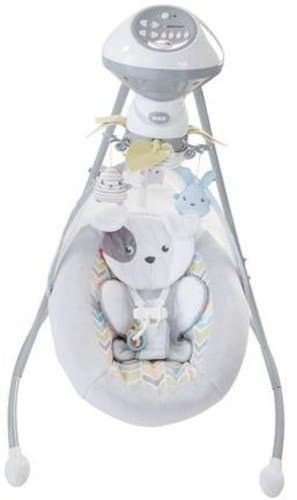 There are also various types of baby swings, but what we are talking about here is a free standing unit that’s designed to soothe the babies through smooth swinging motions. Their weight limit is up to 30 lbs. and some have extra features such as vibration, melodies, nature sounds and toys. Others will have a rotating seat, varying swinging speeds, or swing side-to-side and/or head-to-toe. It’s not, but it helps a great deal. Some babies get so used to being held and rocked that they can’t remain calm or fall asleep on their own. 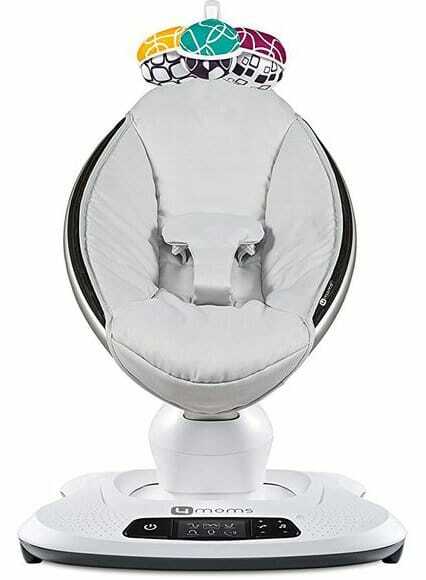 Baby swings give them a similar feeling and even better because some have extra features such as vibration settings. How should the best baby swing seat look like? For the baby to be comfortable and enjoy being in the swing, the seat padding has to be thick and well done. The seat should also be roomy. Some parents think that their babies just don’t like the swings, but the seat might be the problem. Since these swings are used by babies, the cover fabric should be soft and warm. This will add more comfort and the baby will want to go in there. Again, a detachable baby swing seat is a good option because you can detach it to have a stationary seat for the baby. A removable and washable/machine washable baby seat cover is a great choice because it enables you to keep the seat clean, especially because where babies are involved mess just seems to happen. For baby’s comfort, especially those too young to hold their heads up, a reclining swing seat is better because you can position it in the most comfortable position for them. On the other hand, bigger babies love to sit in a more upright position to have a view of their surroundings. Each baby reacts differently when put on a baby swing for the first time. One of the reasons is the swinging motion speed. Some babies love it fast while others enjoy slow motions. For this, you need to get a swing with adjustable swing speed to be safe. You will come across baby swings that only swing back and forth, but there are other options that move back and forth and side-to-side. This is just for spicing things up and you might be surprised to find out that your baby prefers one over the other. Timers help switch off the swing automatically once the set time is over. This is helpful for some parents/guardians as it helps them know how long the baby has been on the swing and when it’s time to take them off. When the baby is not asleep, he/she will need something to keep them busy. Luckily, most baby swings have great entertainment features. They include music, toys that help with eye and hand coordination, a vibration setting and themes. To get the most out of your baby swing, buy one with many entertainment features because your baby will love them. The second most important part of baby swing after the seat is the frame. It should be strong. Baby swings are made of hard plastic, all metal or a combination of metal and hard plastic. The idea is to have a strong baby swing and the best material for this is metal. However, some hard plastic has stood the test of time and will serve you for a long time. You want to avoid falling risks and the only way around it is to get a frame with a great base support. The wider the base surface area, the more stable and supportive the baby swing will be, thus hard to tip over. Again, check on the legs. They should be facing inside or not protrude a lot because you might trip over them. For ease of storage or traveling with your baby swing, the frame should be foldable. There should be no compromise when it comes to the baby’s safety. A baby swing should have a harness, a 5-point or 3-point. The 5-point will restrain both the upper and lower body. On the other hand, a 3-point harness will secure the baby around the hips and the crotch. The former is better for any baby, but the latter will be better for older babies. Remember to check if the harness is strong and comfortable. Every swing will have the recommended weight limit and some will even have a minimum recommended weight. Small babies lack full control of their necks and heads. As such, they need to be in a reclining swing seat to prevent slumping. A baby swing should not be complicated. Taking care of the baby is work enough. It should also be easy to assemble, and get the baby in and out. 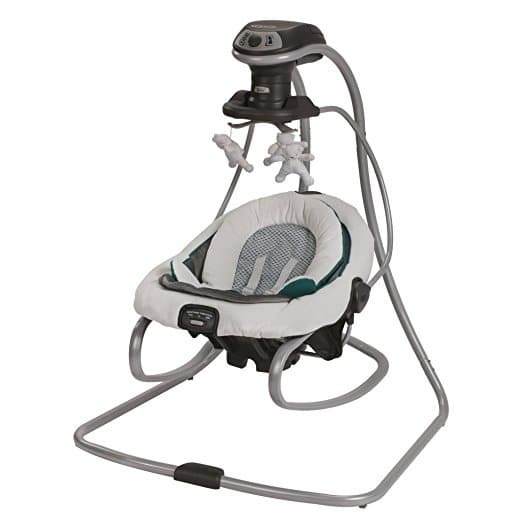 Your baby swing will obviously need to be powered to function, either by batteries or power cord. The advantage of using a power cord is that you only need to plug in. Again, batteries can be expensive, especially if you use the swing a lot and changing them might also be a hustle. However, there’re some that combine both, batteries for the vibration setting and power cord for swinging while others can be powered by either. We only have two hands, but besides the baby, we have so much more to take care of. Thus, having a baby product that can actually soothe and entertain the baby on our behalf is a blessing, even though we will still need to be around and keep an eye on them. That said, the ten baby swings listed above are the best on the market in 2018, and we picked them carefully to cover each need. We hope that you will find the best for your baby.